Dental technology is advancing at the speed of light -- and you do not want to visit a dentist who is caught in the stone age. 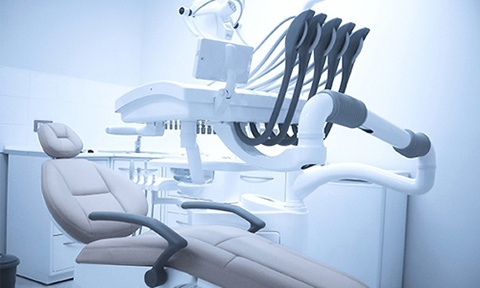 For the ultimate in comfortable, efficient dentistry, make sure your dental team is using the latest technology, like laser dentistry, digital scanners, and more. Guess what? We are! Keep reading to find out how we have invested in state-of-the-art dental technology in Tulsa to improve your experience at Glisten Dental. When we are in the planning stages for restorative dentistry or orthodontic treatment, we need to have a model of your teeth to put together the most effective treatment possible. In the past, this model was created from a bite-down impression that you had to hold in your mouth for several minutes. The iTero Intraoral Scanner digitizes the process -- making it far more comfortable and efficient overall! Scans are highly accurate, ready within seconds, and do not require you to bite down on anything uncomfortable. Early detection is crucial for all oral health issues -- especially for cavities. If we can detect a weak spot in the tooth enamel early enough, we may be able to prevent a cavity from forming altogether by applying a topical fluoride treatment. DiagnoDent helps with that! This handheld tool shines a special light over the tooth enamel, exposing weak areas and allowing us to intervene in the interest of your healthy smile. Risk factors for oral cancer are not limited to smoking and older age. Oral cancer rates are rising in the United States, and the disease is affecting more young and otherwise healthy people than ever. That is why we recommend all adult patients receive a screening at least annually. We use the VELscope, a non-invasive oral cancer screening device to identify premalignant and malignant lesions in the mouth. The earlier this disease is detected, the greater the chances of successful treatment -- and the VELscope provides significant help in early detection. Laser dentistry is changing the way we do a lot of things, including how we perform soft tissue surgeries. This tool can be used in a number of treatments -- like for lip and tongue tie, crown lengthening, gum disease treatment, gummy smile repair, and much more. The laser eliminates the need for sutures and a scalpel, minimizes discomfort and bleeding, and also sanitizes as it works to speed healing and relief. Soft tissue procedures are better with the LightScalpel! 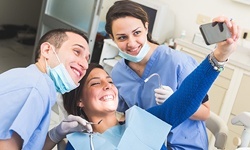 Are you looking to upgrade your dental care? Don’t wait another day to get in touch with Glisten Dental! We can’t wait to help you enjoy the most efficient, effective, and comfortable dentistry possible. Go ahead and contact us today.